There are two options in this case: use an image with the correct size and never scale it, or try to disable anything that could be aliasing the image. This post is going to describe how to do the latter. As usual, an example project is available for download at the end of the post. 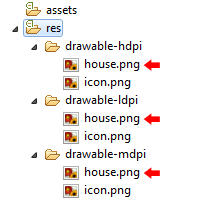 The same image file named 'house.png', inside each of the drawable folders. This ensures that, regardless of the device’s screen density, the image will always appear with the same number of pixels on the screen. 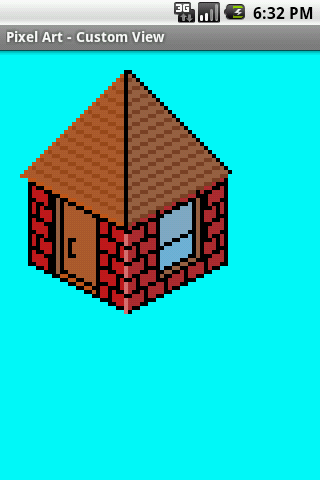 The pixel art could even be scaled proportionally, and the pixels would stay exactly the same. However, this will make the image smaller at a high density screen and bigger if the image is being displayed at a low density one, but he pixels are left untouched. One thing that could be done to remedy that is to create one scaled image for each screen density, which could be necessary if the final physical size of the image on the screen has to stay the same. 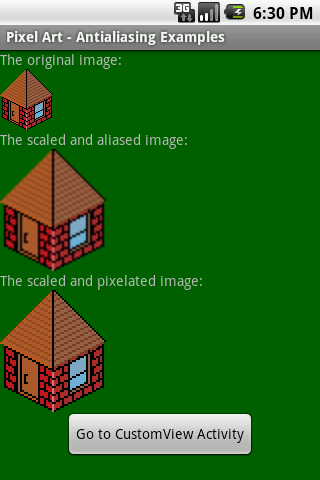 Instead of attaching the whole code, the above is just what is necessary to scale the image without aliasing it. If you need a fully working example, you can download one at the end of the post. As it can be observed, the code creates a ImageView object and a Bitmap. The first is initialized from the XML file, and the second one is created from the ‘house.png‘ file ID (lines 2 and 5). After that, at the 7th line, another Bitmap is created by calling the createScaledBitmap(), although it’s result is being stored at the same Bitmap object. It takes four parameters: a Bitmap; an Integer for the new width; another Integer for the height and most importantly, a boolean that flags whether this image should be anti-aliased. Note that the first parameter is the bmp object, the second and the third are, respectively, the Bitmap’s width and height multiplied by two, and lastly, the anti-aliasing boolean is set to false. The difference between setting the aliasing to true or false. The code starts by declaring a Bitmap and declaring and initializing a Paint object (lines 13 and 15). Next, inside the constructor, the Bitmap is initialized exactly the same way as the previous code (line 22). Them comes the most important part of this View: the Paint object settings. The Paint object defines how a graphic element should be rendered on the screen. We can control some of these options by enabling/disabling some settings. For our pixel art image, anti-aliasing, dithering and filtering are disabled. This makes the image to be rendered as pixelated as possible (lines 25 through 27). No harm done to the pixels, even if the image is rendered four times bigger than its original size. By the way, I think putting the image only once but in the “drawable” folder (without postfixes) should suffice. Thanks a lot, that was explanatory and succint – really helped me out !